The alliteration is a bit much isn’t it… I wanted to say Meandering along the Mighty Murray with Marion but that would have been really over the top! Anyhow, I was travelling with my sister Marion at this time and our aim when we left Penola was to find a nice spot on the river to set up camp for Easter before the crowds filled up the best spots. We found just what we wanted at Martin’s Bend, near Berri in South Australia. On the way we stopped at Bordertown which is known for it’s white kangaroos. Interestingly, they are not albinos as you might think, but a genetic strain of the the Western Grey Kangaroo.They have been successfully bred here and have been sent to various other locations around Australia. Bordertown is also the birthplace of Australia’s former Prime Minister, Bob Hawke. We stayed at the Cadell Recreation Ground and were given a wonderful welcome by Margaret and Michael the caretakers, who remembered me from a one night stop-over on my way to WA twelve months ago…I’m impressed. Had a lovely walk along the Murray, too. The amenities here are immaculately clean and it’s a great stopover at a reasonable price. We had a wonderful stay here at the Walker Flat Boat Ramp Reserve and I did actually catch a fish, thanks to our great neighbour, Jacko, who taught me a couple of new rigs and kept me supplied with river prawns as the bucket of worms I’d bought did no good whatsoever! I now know how to do a Paternoster rig, and also a uni-knot- can’t say I’m an expert, but I can do it! We didn’t stay at Jamestown but went out to a picnic area that would have been a beautiful camp if there weren’t those big forbidding NO CAMPING signs. I drove up behind the Recreation Ground there, though, and found one of the many beautiful stone cottage ruins that dot this South Australian landscape. There is a free camp at the Railway Siding here and the town has a fascinating history. For a start, Terowie was once a town of about 2000 people and now has about 50 residents. Its fortunes changed when they changed the rail gauges, as previously it was the point where all passengers changed trains. When the broad gauge railway was extended from Adelaide/Burra to Terowie in 1880, Terowie boomed, and for almost 90 years Terowie was the break of gauge going North and South. All freight and passengers changed trains at Terowie. In its heyday (1940-50s) there was a population of over 2,000 people – with the rail industry being the main employer. In 1969, the broad gauge was extended to Peterborough and so Terowie began to decline, with many leaving and businesses closing. In 1989, the railways finally left Terowie and the line was ripped up. It rained almost non-stop when we were there, so we didn’t visit the many information boards around the station and railway line, but definitely a place with an interesting history. It is now like a ghost town, as these photos of the Main Street show. So quiet even the chooks peck around the main street footpaths. Terowie’s other claim to fame is it here that General MacArthur’s famous words were reported as he changed trains here taking his wife and family from Darwin to Melbourne. Terowie became a large military camp in 1942. When US General Douglas MacArthur arrived on our platform in March 1942 with his wife and son after escaping from the Philippines his famous words ”l came out of Bataan and I shall return” were reported here. I’m not sure I’ll return! 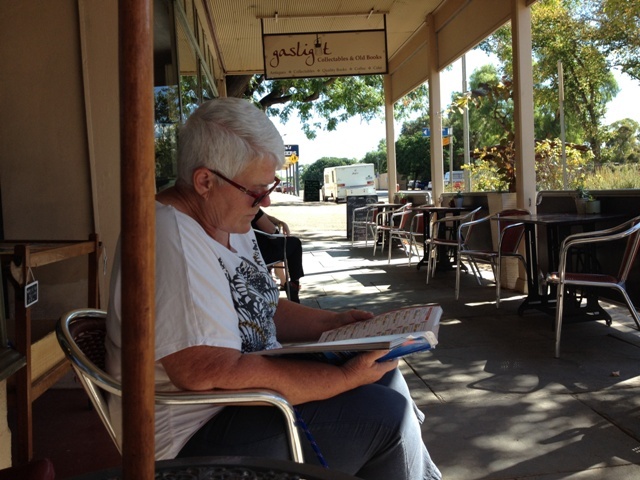 Our final stop together was at Gladstone where we shouted ourselves a caravan park to catch up on domestic duties. It was also a good place to do a couple of day trips to local attractions, so we duly went off to the Wirrabirra Produce Market on the Sunday and had a look at the community campsites at Laura and Wirrabarra while in the area. I would definitely recommend these if you are travelling through this part of the country. Gladstone has a remarkable old gaol which we visited, too. It was closed in 1975 because they only had bucket toilets! Then it was time to say farewell to each other as Marion headed back to Peterborough on her way to Broken Hill and all points East, and I travelled up to Quorn on my way to Port Augusta and then all points North. I’ve already told you about the Pichi Richi Railway journey that I had in Quorn, so my next adventure is when I leave Port Augusta and start the long trek towards Darwin. So much to see….. Categories: Australia, Camping, Travelling | Tags: Burra, campervans and motorhomes, Gladstone Gaol, Jamestown, Martins Bend, South Australia, Terowie, Walker Flat | Permalink.